Building a sound strategic customer plan calls for making some really tough decisions. You know that providing unique and authentic experiences to your customer is an integral part of the plan - but balancing that alongside meeting your short-term business goals, requires true organizational alignment in order to achieve real success. Deliver the experiences your customers have come to expect from your brand means knowing your customer, what they value and translating that value into what matters most. How well do you know your most valuable customers and are you connecting your VOC data back to the customer strategy? The Total Customer Experience Leaders Summit is uniting cross-industry, customer-focused leaders to share best practices in linking data-driven behavior to business results, designing next generation customer experiences and measuring the impact of customer programs. Download the brochure for full details here. Many experts are touting the virtues of "Customer Centricity" as a valuable emerging business model, but there is a lot of confusion about what this concept means - and uncertainty about whether and how it actually leads to greater profitability. The purpose of this session is to bring clarity to both of these issues. We begin with a brief review of Professor Fader's recent book but then dive deep into the profitability questions. We examine the main tactical "building blocks" underlying customer centricity and point out some subtle but important insights to help managers make the most effective and efficient use of each of them. And more, download the brochure for the full speaker list and session descriptions. 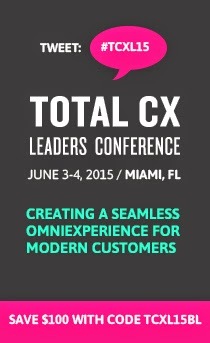 Register today and lock in the early bird rate for Total Customer Experience Leaders 2013 - save $300 off the standard rate.